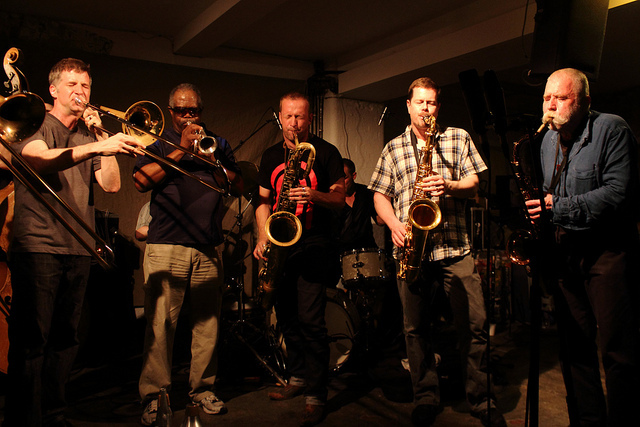 Ever the contrarian, there were in fact eleven members of Peter Brötzmann’s Chicago Tentet for their three day residency at Cafe Oto. Eleven. This was more than an attempt to simply be “one louder”: in an interview conducted for the BBC beforehand, tentet member Ken Vandermark was rightly insisting Brötzmann’s reputation as the crazy shrieking sax player was – at least in part – a lazy journalistic invention. There is so much more to him than this; even when paired with Japanese noise guitarist Keiji Haino at Oto the previous week, the subtler side of his talents was still apparent. What the big band format in fact gives Brötzmann, aside from a financial headache, is sonic possibilities, different formations of musicians, from solos, duos, trios, quartets, right up to and including the full force of all eleven blasting away at once. 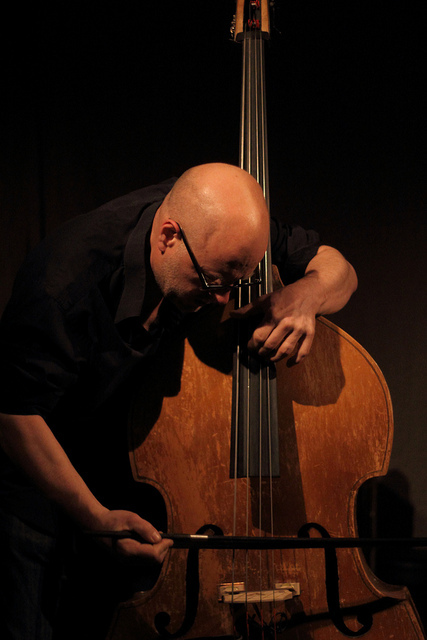 Over the three days, the formal lineups included, as well as the tentet+1, Joe McPhee’s Survival Unit, a brass quartet, the Sonore saxophone trio, as well as solo sets from tuba player Per Åke Holmlander, cellist Fred Lonberg-Holm, and the bass player Kent Kessler. And that is before we get to the countless combinations which assembled and disassembled organically during the course of the big band sets. 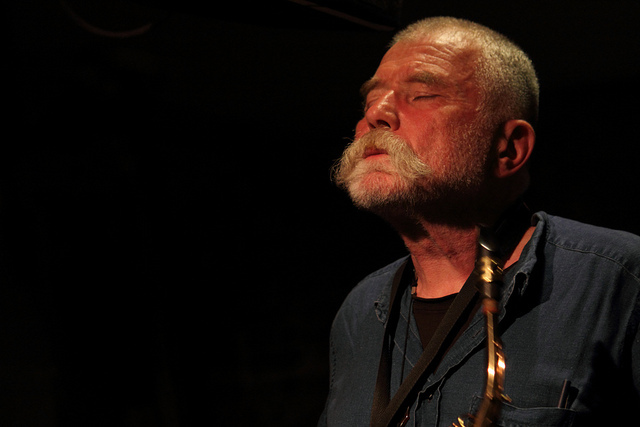 Tonight’s warm-up sets – as if we needed warming up in a busy Cafe Oto with temperatures of 25 degrees celsius outside – were to come from Kent Kessler, and the heavyweight Sonore trio of Ken Vandermark, Mats Gustafsson and Peter Brötzmann himself. 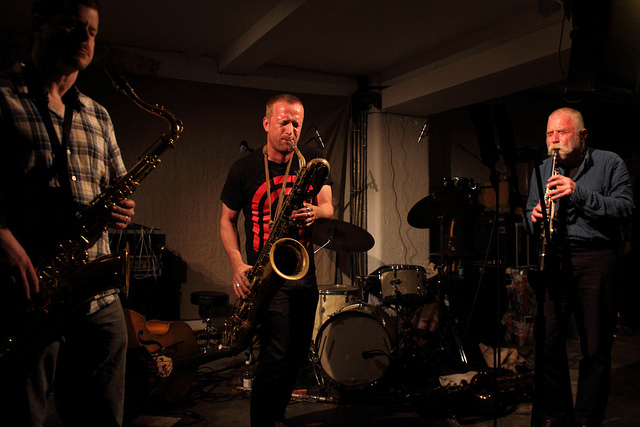 Vandermark, Gustafsson, Brötzmann: does it get any better than this? Their styles complement each other so well: Vandermark the more cerebral and technical, Gustafsson entirely visceral and all extended technique, with Brötzmann’s filling the space in between with his own light and shade, from melodic runs to huge, growling vibrato. Unusual textures abounded, from some eastern-sounding clarinet scales from Brötzmann (his instrument sounded like a whole troupe of Moroccan double reed instrumentalists) to notes from Gustafsson which sounded like they were split four ways. But it was their ability to respond to these that made this performance so special, taking them as trio into some really unpredictable spaces. For example, their first piece saw them all converging around some squealing, fluttering high notes, sounding like a whole flock of birds; this was easier for Ken Vandermark on the top end of his clarinet, but how the hell Gustafsson reached those notes on a baritone saxophone is completely beyond me. Later, when Brötzmann and Vandermark meshed two high-pitched sax and clarinet melody lines like two giant, fast-spinning cogs, he counterintuitively came in with the lowest, slowest drones he could find. It ended with all three back on sax, Vandermark and Gustafsson kicking and spitting, before Brötzmann entered with glorious song-like melody which harked back to his hard bop heroes. To answer my earlier question: based on this hugely entertaining set, no, it really doesn’t get any better than this. Kent Kessler’s short bass solo was a welcome relief after the dizzying Sonore: from some sombre arco with knuckles dragged down strings, to some light, dancing pizzicato, there was suddenly just so much air and so much room to breathe. If you closed your eyes at times you could have sworn he was playing a violin, so high-pitched and fluid was the sound; while towards the end of the set, all creaks and arco groans, you might have though he was bowing the bow of a centuries-old boat. And so to the endless permutations of the eleven-man tentet. Over the course of this hour-long performance (an hour which flew by, it has to be said), we heard Peter Brötzmann playing with the two trombonists Johannes Andreas Bauer and Jeb Bishop; Mats Gustafsson playing with the drummers Paal Nilsen-Love and Michael Zerang; Joe McPhee on pocket trumpet in a unit with Nilsen-Love and Fred Lomberg-Holm’s cello; a bass and two trombone trio; a Brötzmann/Nilsen-Love face-off; Lomberg-Holm up against Brötzmann on clarinet; Gustafsson sparring with cello and drums, and solos from Bauer, Vandermark and Brötzmann. So many great bands, all within one large grouping. Brötzmann always led off each piece, setting the initial tone, usually returning towards the end to sum up; but in between Gustafsson had a role in organising and cajoling the brass, conjuring order from a situation designed to encourage the opposite.